What I once thought was a place for brides-to-be and crafters to collect ideas is now a great place to share information about dogs. 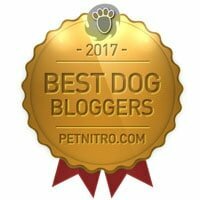 In fact, I use my Pinterest account to share Little Dog Tips posts and content from other users that I think my readers would find helpful. There’s no shortage of amazing homemade toys, DIY projects, and healthy treat recipes on Pinterest. You’ll even find some great training tips on there. But you’ll also find false information that could ultimately lead your dog’s death. Pinterest’s image-heavy style means that false information is often presented in an attractive, believable way. If an infographic exists of the information, you may forget to look for sources, or evidence that the information came from a veterinarian, a professional trainer, behaviorist, or otherwise, someone you can actually trust for advice. Never give your dog OTC human medications! 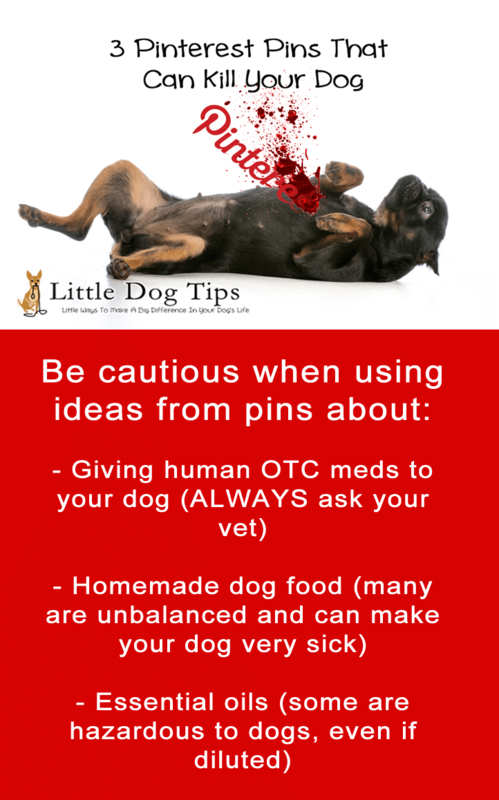 There’s an extremely popular pin that advises how you can use over-the-counter human medications like aspirin for common dog ailments. It even tells you how much to give according to your dog’s weight. The problem? It’s not just about weight. Your dog’s breed, body condition, medical history and medical issue are all factors your veterinarian will consider before they prescribe a canine medication, specifically formulated for dogs. If you mess with OTC medications, your dog could suffer from internal bleeding, kidney failure, heart failure, vomiting, diarrhea and other side effects. Then, you’ll end up with an even bigger vet bill. When your dog is in pain or has gastrointestinal distress, it could be mild ailment, but it could also be a sign of something more serious. If you’re trying to treat an issue yourself, you could be wasting time as your dog’s condition worsens. There’s plenty of medication-free ways to relieve your dog of mild conditions. A spoonful of canned pumpkin puree can clear up constipation or diarrhea. A warm compress can ease pain. A tiny amount of ginger can help nausea. Even natural remedies can backfire – always check multiple sources and start with a small dose if you must attempt to treat a very mild ailment at home. Don’t Rely On Pins To Make Homemade Food! Making homemade dog food is a good thing. But kibble is better than an unbalanced diet. Our guest post on raw feeding is a great place to start, but you’ll need to do much more research before you’re ready to ditch the processed foods. Heat cooks away vitamins and nutrients, but a home-cooked, balanced meal is still better than kibble – you may have to use supplements to get those nutrients back. Just like a raw diet, a home-cooked diet should be thoroughly researched. 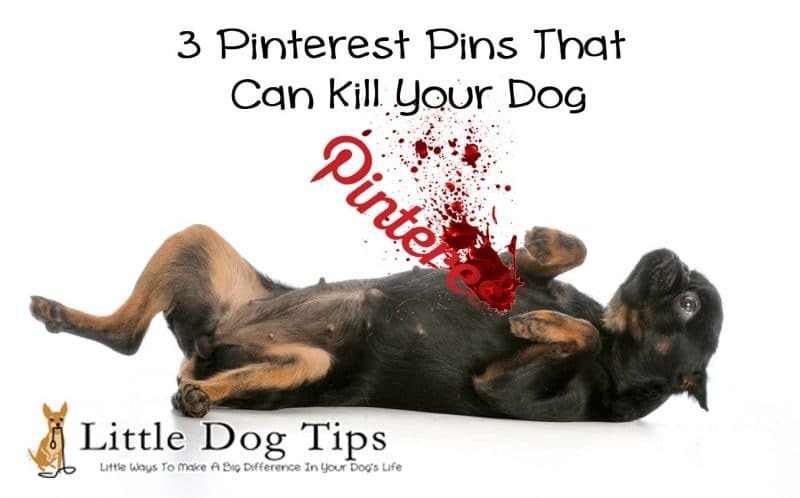 I’ve seen a devastating amount of pins about creating dog food that is completely unbalanced. Dog food should be lightly cooked, at most – not tossed into a slow cooker for hours. It needs to include bone or some calcium source. It should contain very few carbs, and it should consist mostly of meat. Don’t Use Pinnable Essential Oil Recipes On Your Dog! Essential oils can be used to repel fleas and ticks, and to calm an anxious dog. But they have to be diluted properly to ensure your dog does not get poisoned. Some oils are always unsafe for dogs. For example, tea tree oil causes paralysis, seizures and death, yet when I searched “Tea tree oil dogs” in Pinterest, I found a lot of recipes for creating an ear cleaning solution. If you don’t know how to use essential oils properly on your dog (I know I don’t!) 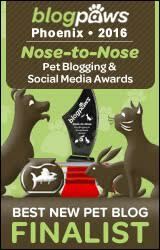 just purchase a pre-made blend specifically designed for pets. Only use products from a company you trust with plenty of positive online reviews. Many dog treat recipes on Pinterest are excellent. They contain very few ingredients, each of which you can easily Google to ensure they’re safe for your dog. If you’re unsure if something you found on Pinterest is true, bring it up with your veterinarian. If you don’t have a vet visit coming up, you can find many dog professionals on Twitter – just tag them in a tweet and send over a link to the pin. If they’re not too busy, they might take a moment to offer their opinion. The big idea: research, research, research! If any idea is truly worth Pinning, you’ll find it from multiple reputable sources. Anything else is a gamble on your dog’s life. The internet can be a dangerous place for advice on your pets. Lucky for us we have our vet and emergency vet on speed dial (do they still call it that?). Also, one of our long time friends is a veterinarian. It’s always a good idea to consult with an expert before doing anything that might harm your dog. Thank you so much for writing this. There’s one particular Pin I see all the time regarding human medications you can give your dog and it makes me shake my head every time. Relying on the internet for medical issues/questions (and changing up their entire feeding routine) is very scary indeed. Yeah, I bet it’s THAT pin, it’s so professionally designed that anyone could easily believe it’s from a credible source. It’s tough because I know people get desperate when they can’t afford the vet. One thing I have to disagree with you on. Tea Tree Oil, when mixed properly with water and diluted, makes a very good flea repellent in SMALL doses. We do agree whole-heartedly on the OTC meds thing. I’ve seen pet parents give aspirin or amoxicillan to their dogs for joint issues and stomach bugs. Really? And then you wonder why the dog pukes. I’m still trying to figure out the whole BARF diet. So I have more posts to read and research to do. We’re loving the BARF diet! It’s not as expensive as I thought it would be, and I just source from Asian groceries, mostly. If you have a co-op near you it may be even easier. Do you have any good resources on tea tree oil for fleas? I’m thinking there’s a lot of natural options that have a lower risk. When I use a small amount of tea tree oil on my own skin, my dogs refuse to be near me. Sorry it took a couple of days to get back to you. I found three resource pages that might be of help here. All three report the same thing. Tea Tree oil, when used pure, is highly toxic and dangerous to pets. But, when diluted to about 1%, or roughly a 50/50 solution with water or shampoo in an 8oz. drinking cup – you can use it as a spray or lotion type topical solution. I always mixed up a batch small enough to fit into a 4 oz glass (think orange juice or small water glass). Then I filled up an eye dropper and applied it similar to Frontline along the shoulder blades. If the fleas are bad enough, mix up about 6 oz. for a spray bottle and get the coat damp, NOT WET, because you have problems again with highly soaked areas. Then message the area with your hands to work it in, again like Frontline. It also helps to plan a bath date with the dog the following day. 1) it removes the dead fleas and eggs; and 2) it removes any residue from the oil which prevents irritation. The first link is the only one written by a vet, but it works – .1 to 1% is such a mild dilution, if it’s not too much trouble to get the ratio right it doesn’t sound like a bad idea. What also matters to me is the smell – I don’t think it would be too irritating to the dog’s nose at that dilution, and if it works, it works! I haven’t yet found a natural flea solution that my dogs don’t hate the smell of, but I haven’t decided yet if I should give a very mild tea tree dilution a try – I’m still a bit worried! Even at that amount there will be a slight odor, but I haven’t run into a dog that won’t tolerate it. I started using Tea Tree Oil because one of the apartments I lived in had flea problems so bad that neither Frontline, nor baking soda, would stop them. It was a last ditch attempt and it worked. Mind you, it is a short term solution and does not last near as long as Frontline would (think weekly application opposed to monthly). Try it as a spray first. Mild mist, and just enough to get the coat damp not wet. But if there is a concern, look further before use. “It must be true; I read it on the internet.” I have given my dog OTC medication before, but only at the specific recommendation of my vet. Ours pups are our babies and I would no sooner try a home remedy on them than I would one of my children without clearing it with their doctors first. This is a great reminder! Never believe everything you read in the paper, see on the news, or on the internet! It’s so important to do your own research and talk to your vet and never just assume. Even when your vet gives you advice, ask questions and even more questions. 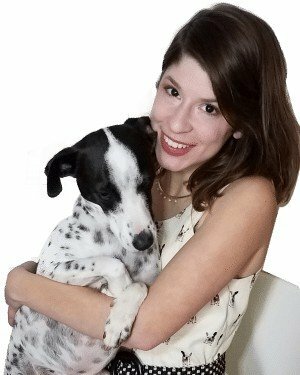 We must be our own advocates for ourselves and our dogs!